Darren : It was late in the year of 2001 when I was convinced to return to the dump that Maurice had completely over-turned during that year. I went back to a test-hole that I had previously dug, one that Maurice thought I should expand. It wasn't that big, maybe 2 x 3 x 3 feet deep. I had hit nothing but window pane glass in this hole and since this is a shallow dump, I had given up on it fairly quickly. Looking down to where Maurice was digging, there appeared to be a pattern. Every trench started about where my test-hole did, and then went into the hillside. And that was where Maurice made his finds. Several trips later, I had something that I could work with. The test-hole was about 5 - 6 feet wide and about 6 feet into the hillside with a 3 foot face exposed. The ash layer here seemed a lot less impressive than further down the dump and was only about 8 - 12 inches thick. After I had dug past the window pane glass, I found a few common bottles that were not that old including blank druggists and a never ending supply of liquor bottles. The weather was holding out and our digging continued. My test-hole now resembled a cave and started producing some older shards along with bottles like Murray & Lanman Florida Water and Dr. Thomas' Eclectric Oil. I finally saw the base of what looked to be a quart soda. Patiently exposing more of the bottle, I reached around to feel the embossing on the other side. I thought to myself "Please don’t be broken!" I tried to jiggle it out, but it would not budge. This is normally a good sign because it means the bottle is all still there. As I started to reveal the neck I found metal which, at first, looked as though it was covering the top. But I soon found out there was no top to cover. Now being a little less careful I pulled the bottle from the ground to view the embossing which was "A.W. BROWN / BRAMPTON" (aqua) with the trademark grape design that Francis Matthews also carried on his Brampton bottles. Although this was a disappointing find, it was also a good sign of what might be ahead. Maurice: I too had dug pieces of two "A.W. Brown" (aqua) squat sodas, and pieces of an amber "F. Matthews" squat soda. Having never seen examples of these bottles, even the shards made for an interesting discovery and new desire to find of these babies. Darren: It was now mid-January in 2002 and it was 15°C, so we were taking advantage of the frost-free ground. The weather was nice, but the hole wasn't giving me any incentive to continue. To begin with, I had to get rid of all the broken jugs and blank soda bottles Maurice likes to stuff at the back of my holes. It's a favorite trick of his, watching me think I have found some good stuff that had fallen free. Finally, after a couple of hours, I pulled a cobalt Underwood's master ink out and again, like the A.W. Brown, the top was missing. It wasn't until about an hour later that I pulled another "UNDERWOOD’S / INKS" out. This time it was intact. Unfortunately, the first bottle that had the top missing also had the better embossing and a deeper cobalt colour, but at least I had something to take home. After that warm weekend, the deep freeze set in and it was time to pack her in and wait for spring’s thaw. The spring of 2002 brought many good finds for both of us and I finally hit that bottle vein running through the dump. In my case, I hit a vein of amber glass which included: "REINHARDT & CO'S / LAGER / TORONTO"; "SLEEMAN'S / EXPORT / LAGER" deep red amber applied top and nicely whittled; “NONSUCH. INTERNATIONAL / STOVE. DRESSING / NONSUCH. MFG. CO. / TORONTO. ", "DAVIS & LAWRENCE CO LTD / MONTREAL"; and my very first and to this date still my only "WARNERS / SAFE / CURE / ROCHESTER / N.Y.USA / LONDON - ENGLAND / TORONTO - CANADA". Maurice: Darren’s spot was producing like I had predicted, and my own expectations had been raised after last years finds. So I continued from where I left off, starting where the ground had thawed. It only took a few minutes to expose a “W.E. Welding Brantford” (blue flower with handle). This location turned into a cave of sorts, with much of the surface ground and roots frozen. I added the following to my collection: "kickapoo oil" (aqua); "Okeefe’s Pilsener" (aqua/crown top); unmarked cream spice pottery bottle; "A. Trask’s Ointment” (clear); "Ayers Cherry Pectoral Lowell Mass. U.S.A" (aqua); a tooth pick holder (cream ceramic / two winged flower shape); a white butter dish with flowers and gold trim; a cream butter dish with "J & G Meakin Hanley England" on the bottom; two no-name bowling pin crown tops (JK & B –on bottom / aqua); "J.J. Mclaughlin ltd Toronto" quart (aqua); "Okeefe’s Pilsner" (aqua/crown top); "Underwoods Inks" (master / cobalt / screw top); "Bickles Anticon Sumptive Syrup Northrop & Lyman Co ltd Toronto" (aqua); "Pharmacist J.A. Austin Toronto" (clear); "Healy & Bigelows Kickapoo Indian Oil" (aqua); "Hamlin’s Wizard Oil Toronto Ont Canada" (aqua); "Wulfing’s Formamint" (amber); "Reed and Carnrick Pharmacists New York" (amber); "Glover’s Imperial Manage Remedy H clay Glover DVS New York" (amber); "Karl Seufer Cleveland Ohio" (aqua blob top beer) and (so I’ve been told) a rare "Dawes & Co Lachine P.Q." (dark green beer). Darren : This was the first time I had success with finding pharmacists bottles. I added to my collection a clear "WELDON J. GRAHAM" from Ottawa, a clear "THE ROBERT SIMPSON CO. LIMITED / TORONTO CANADA", a clear "PRESCRIPTION DRUGGIST / P.B. PRETTY PHMB. / BLOOR & DOVERCOURT, RD. ", a clear “J.R. LEE / DISPENSING / CHEMIST / TORONTO / ONT.” and a clear "DRUGGIST / R.P. COOPER / COR. QUEEN & YORK ST."
I had a few other interesting finds throughout the spring months including a Wilson’s Humber cigarettes sign which I accidentally destroyed clawing through the ash, a clear ground lip breast pump, a small James Keiller & Sons Dundee Marmalade, an Arabesque transfer chamber pot with missing handle, a dark tan Doulton Lambeth stone blacking pot, a deep green olive oil bottle and a transfer stoneware fragment with "HARDING BROS., / WINE & SPIRIT MERCHANTS, / GUELPH, ONT." I also found a few mustard crocks, one of which had a little extra inside. As I pulled the crock out, I turned it upside down to shake out any dirt and heard a rattle. I looked inside to see if it was a clump of dirt and I found a porcelain angel, I wonder why someone would have thrown it out? I took this as an omen of good things to come. Some other bottles I found were: an aqua "HEALY & BIGELOW'S / KICKAPOO / INDIAN OIL"; aqua "BALSAM / HONEY"; small clear "THE T. EATON CO. / LIMITED. / 190 YONGE ST. / TORONTO"; small light amethyst "WYETH & BRO / PHILADA"; clear "SEELY’S / PURE / FLAVORINGS"; clear "CANADIAN KODAK CO. / LIMITED / TORNTO CANADA"; clear "ROBT RALSTON &CO / HAMILTON. ONT. "; clear "MERRILL’S / MARVELLOUS / MEDICINE"; a clear "SLOCUM’S / COLTSFOOT / EXPECTORANT"; clear "SHIRRIF’S / FLAVORING / EXTRACTS"; aqua "DR. CHASE’S / SYRUP LINSEED’S TURPENTINE / EDMANSON BATES & CO."; a small green case gin and a clear "TEABERRY / FOR / THE TEETH / AND / BREATH / R.S. THOMSON / TORONTO". Maurice: At this point, the realization had set in that the older vein had run its course, and every dig would require a lot more time just spent just in removing the cap layer. In one of these twin deep holes I dug a pinkish unmarked crock and a large Toronto pottery jug. I was satisfied with finding: a "Robertson & Brooks Mount Forest" (aqua/crown top); "J.J. Mclaughlin Toronto" (aqua); "Adonis hed rub" (clear); "Hughel’s Trade Dander Off Mark Hair Tonic Dandruff Remedy" (clear); "E.B. Shuttleworth chemical coy limited Toronto" (clear); "Sanitol" (light blue milk glass); "Rob Ralston & Co Hamilton Ont" (aqua); "Hirsts Pain Exterminator" (aqua); "Henry K Wampole Co Perth Ont Canada" (aqua); dark brown pottery ink; "W.T. Co U.S.A." on the bottom cobalt poison; "Elliman’s Royal Embrocation for horses manufactory slough" (aqua); two "Paine’s Celery Compound" (aqua & clear in different sizes); "Seely’s Florida Water" (clear in two sizes); "The Genuine Smalls Syrup Canada" (aqua); no name easy vacuum seal (aqua, "4892 patent 1341 C.S. & co Ld" on bottom) and a doll-size white plate and pouring pitcher. Darren: The weather was getting warmer now and Maurice was trying different spots he had on the go. I had been working steadily on my cave and had hit more metal. It took a while to loosen the rusty plate, but I finally ripped it from the ground. In behind I saw the distinctive shape of a ginger beer. Maurice was standing beside my hole and I pulled my head out and said, trying to retain my excitement, "I think I might have a ginger beer!". Looking back into the hole, I recognized the shape as a stovepipe style Brantford Stoneware Manufacturing Co. bottle. This shape could only mean one of a few places: Orangeville, Alliston, Brockville or Brampton. My hopes were riding on the latter, trying not to forget that I had yet to find out if it was in one piece. To my surprise, the bottle came out easily and there appeared to be no pressure from the 3 -4 feet of earth above. I backed out of the hole slowly, exposing my latest find to daylight for the first time in about a century. Maurice was waiting to view the bottle which was completely covered in muddy earth. I gave the bottle its unveiling rub and the words "A.W. BROWN. / ENGLISH GINGER BEER, / BRAMPTON, ONT." appeared in all their glory. I couldn't believe it; the bottle was in excellent condition. Maurice had dug one a couple of years earlier on our foundation dig. 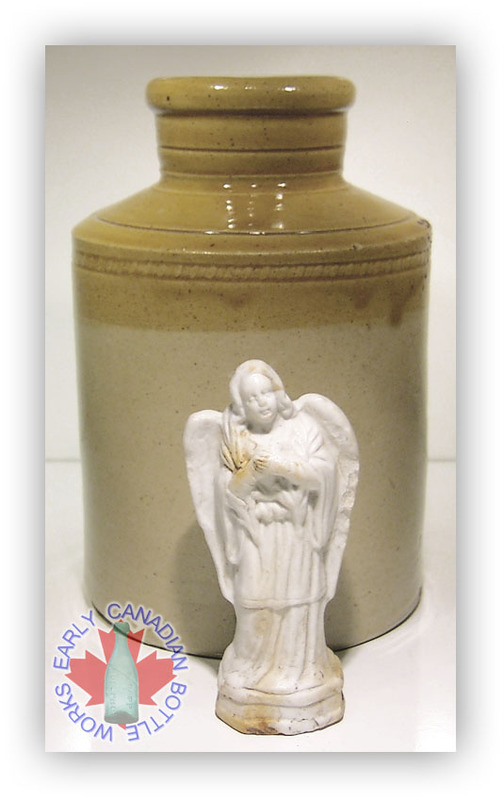 His bottle appeared in the book "Transfer Printed Ginger Beers of Canada" by Phil Culhane & Scott Wallace and was considered a one-of-a-kind piece. Maurice and I are in possession of the only two known, imagine that! At this point I thought, "That's it, I'm done for the year!" because I knew it would be hard to top this find. I can tell you that there is nothing like the excitement of digging an extremely rare ginger beer, especially one from your hometown. Maurice could not get over the fact that with such little digging, I had made a spectacular find. Other than my Copp, Guelph C.W. that I found on our dairy farm dig, I consider this is my best find to date. Maurice: A third of the digging season was left and this dump had proved it could produce some exciting finds. But where to dig next was the question, so I opted to keep trying new and old spots. With about four holes on the go, I started another one in the previous diggers' cast-off locations. I went as deep as I could (only 4 feet) under the rocks and roots where previous diggers might not have bothered. For my two day effort, I found: more honey pots and mustard crocks; a pottery cream lamb balancer with pulley; "Milk Weed Creaming Rams" (milk glass); "California Fig Syrup Co San Francisco Cal, Louisville N.Y." (clear); "Hayhoe's Lemonade Syrup" (clear); "Frostilla Holme’s Fracrant for the toilet" (clear); "The Duffy Malt Whiskey Company Rochester N.Y. U.S.A." (amber); and dirt in the eye trying to reach a “Boots cash Chemists” (clear ). That was a painful lesson. What makes this little spot memorable is the 1911 Canadian quarter that I had unknowingly shovelled out of the hole and left exposed to that nights rain fall. I returned the next morning to find it sparkling on top of a mound of cast-offs. Without a sifter, and the time, I wonder how many little items I’ve just pitched aside. Back to an old hole, but branching off in a different direction, I hit a nest of Underwood inks (aqua & clear, screw top & cork, round & coned), as well as a shear top aqua ink with a B in a diamond on bottom, and a square ink (aqua) with two pen rests. I dug: a "Laurentia" pint in perfect condition, a neat "7 Sutherland Sisters hair grower Toronto" (clear); "Kirkendalls Kendaline for the skin" (clear); "Pleasant Worm Syrup Dr lows Toronto" (clear); "Horton Ca to MFC Co Detroit Mich" (clear/screw top); a crude "Chesebrough MFC Co Vaseline" (amethyst); and my first enamel sign. The sign had white lettering on a blue background and read: "Founded 1871 Ocean Accident and Guarantee Corporation limited" in small print it was made by "Acton Burrows Co Toronto." I wonder if there was a branch office in Brampton. The last digging spot of the year brought me to the very shallow south edge of the dump. I found another different size (3vl) of the "Jack Drug Co The Rexall Store phone 200 Brampton" (clear), as well as my first "Brampton Dairy Co" bowling pin style pint. This spot was good for perfumes made in crude glass; multi sided, with names such as Nyal’s and Seely. I pushed over a white rotted dead tree and under it I found two beautiful shear top inks (dark green L on bottom & an aqua eight sided). Branching out in all directions I found: a "Coca-Cola Canada" (straight sided / aqua / 1 above company); "Imperial" half pint (aqua); "Ozone is life The Ozone Co of Toronto limited" (aqua); "Vinol" (amber); "The Robert Simpson Co ltd Toronto Canada" (clear); "Wheeler's Tissue Phosphates" (monogram on bottom / aqua); "Fluid beef Cordial" (amber); "The Imperial" quart (aqua / ground lip); a chamber pot in white with embossed sheaves of wheat marked on bottom "Ironstone China W & E Corn Burslem" and a neat "Coronation Souvenir 1902" miniature vase (cream / picture of King & Queen with one of two handles missing). The shear Quantity of my finds kept my interest but alas it was no repeat of 2001, so I would have to say that 2002 was Darren’s year for the great finds.